It’s Day 14 of this year’s 31 Days of Horror, and we’re talking about Hush…Hush, Sweet Charlotte from 1964!! If you’re a listener of our podcast, then you’ll recall we’ve done an episode over Bette Davis (who is the star of this movie) and an episode over Hag Horror (which is the genre of this movie). Both of those episodes were picked by Kelley, so she’s clearly a fan. She also didn’t pick this movie as her “good” choice for that Hag Horror episode; instead, she chose What Ever Happened to Baby Jane?, which is quite surprising to me because Hush…Hush, Sweet Charlotte is far and away the better film, even if the two are very, very similar. Oddly enough, though, Kelley wasn’t the one who added this movie to our list this year. I was, and I didn’t include it to appease or amuse Kelley, either. I added it because years ago, my good friend Buzz tried to get me and my wife to watch it as his house late one night. Having never heard of it, I was skeptical but I will pretty much watch any movie anytime, so I agreed. After the opening scene, which is quite shocking and horrific, I was hooked. My wife, however, is not a night person, and neither is Buzz, so both fell asleep not too far into the movie. I decided I would try and finish it with them later, only later never really happened. Every time it seems we’re actually going to meet up to watch it, we end up doing something else or we get sidetracked or life happens or whatever. But I take 31 Days of Horror seriously, and I knew if it was on the list, I would watch it no-matter-what, even if that meant without Buzz, and unfortunately, that’s exactly what it meant. I suppose it just wasn’t meant to be, but I still owe it to him for turning me on to this film (and I suppose for having good taste in movies in general), but I digress. The plot revolves around a man named John who is cheating on his wife with Charlotte in 1927 Louisiana. The two plan to elope after a lavish party, but when Charlotte’s father gets wind of their plan, he is furious and privately tells John he must call it off. John reluctantly does so, and Charlotte does not take it well. The next thing he knows, he’s being attacked with a butcher knife and loses a hand… as well as his head (this is that shocking thing I mentioned earlier). Charlotte returns to the party all covered in blood, and the people there freak out, naturally. Flash forward to 1964, and the tale has become somewhat of an urban legend. Charlotte nows lives alone as a recluse at her father’s house (where the murder occurred) and except for her housekeeper Velma, she hardly ever sees anyone. Complications arise because it seems there’s a road that needs to be built where the house stands, and she apparently has no say in the matter. The whole place will be torn down, forcing her to find somewhere else to live and start fresh, though that is the exact opposite of what she wants… mostly because she has never recovered from that horrible night. And when her cousin Miriam shows up to help with the whole situation, Charlotte begins to lose touch with reality, seeing strange visions around the house. 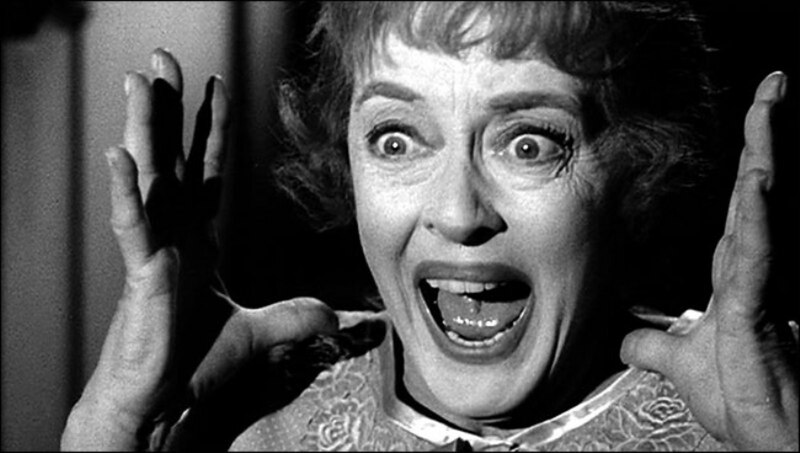 That may not sound much like What Ever Happened to Baby Jane, but the two movies both revolve around a horrific accident that took places years earlier, leaving the title character (played by Bette Davis in both films) isolated and insane in her father’s house. They both involve a housekeeper who learns too much and eventually pays the price for it. They both play out as sort of a whodunnit with a twist ending that changes our perception of said title character. And they both nearly starred Bette Davis and Joan Crawford; in fact, Joan Crawford was originally cast to play the part of Miriam, and even shot several scenes, but for various reasons (including an illness), she was replaced with Olivia de Havilland. I think this movie works better because Bette Davis’ Charlotte character is much more sympathetic than her character of Jane in Baby Jane, where she essentially played the villain. She may be crazy, but we in the audience knowd where she’s coming from and can feel her pain. She lost the love of her life and we’re able to go along with her spooky visions of him because we understand her sorrow. I really enjoyed her performance overall and don’t feel like she hit a wrong note, which is quite an accomplishment considering all of the crazy things going on. Also, I think the effects are quite good, and seeing a severed hand on the floor, and a decapitated head rolling down the stairs, really caught me off guard. The film opens on that murder sequence and is able to maintain its creepiness throughout. 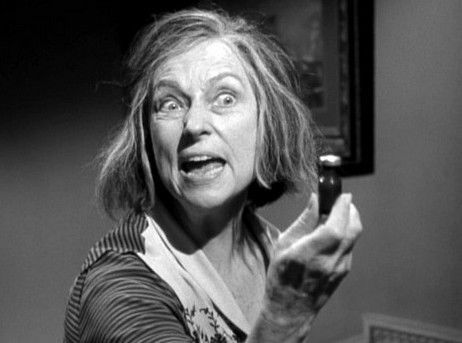 The one thing I did not like was Agnes Moorehead as her housekeeper. I think she’s way too over-the-top to be taken seriously, especially with her put on New Orleans accent. I may be in the minority, though, because she was nominated for an Academy Award for this!! It reminds of me of Anne Ramsey being nominated for Throw Momma from the Train. Both terrible performances that were somehow praised at the time. I suppose I’ll never understand. For tomorrow, Kelley will close out the 1960s with her review of Roman Polanski’s Repulsion! !